With the ZQ500 Series Zebra puts the icing on the cake on mobile printing. The direct thermal printers have been conceptualized for reliability in nearly every environment, and they shun all adverse conditions. Falls from heights up to 2 m, vibration, splash water and particles of dirt have no negative effect on the printers. They are certified to meet both MIL-STD-810g and IP54 standards, and do exactly what users expect them to print. A large operating temperature range between -20 to 55 C allows for operation in any weather. Therefore, nothing stands in the way of their usage in light industry, transportation and logistics, for public authorities and field technicians, organizers, etc. 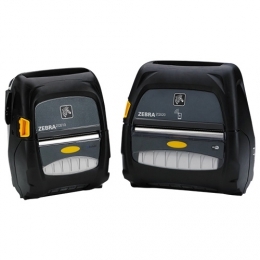 The ZQ500 mobile printers offer users easy handling. Extra-large keys and an intuitive user surface ensure that print jobs run smoothly, even when wearing gloves. Features such as the integrated real-time clock and draft print mode for quick text prints up to 127 mm per second also support users in working with the greatest possible efficiency. There are two models available, which mainly differ in their printing/media width max. media width 80, respectively 113 mm. Both models come standard with an MFi-certified Bluetooth 4.0 radio module with SmartReady functionality, meaning that they operate very energy efficiently. Optionally you also receive the ZQ500 printers with 802.11 a/b/g/n Wi-Fi with dual-band support for 2.4 GHz and 5 GHz. For even better wireless coverage and more operational flexibility, opt for the variants with the multi-port radio module, for the simultaneous operation of Wi-Fi and Bluetooth 3.0.
ebra made integrating the mobile printers easier, thanks to their standard support of the Link-OS software environment. This way, you benefit from many helpful tools, such as simple remote maintenance. All printers also support operation with mobile devices, independent of iOS, Android or Windows operating systems. Expand the potential of the ZQ500 printers with professional original accessories, such as vehicle mounts and docking stations, powerful rechargeable batteries, and a very robust protective case. This way, the printers are even IP65-certified against low pressure water jets from any direction, as well as total dust ingress protected.